There are 23 classic design patterns, which are described in the original book, Design Patterns: Elements of Reusable Object-Oriented Software. These patterns provide solutions to particular problems, often repeated in the software development. In this article, I am going to describe the how the Adapter Pattern; and how and when it should be applied. The main feature of this pattern is reusing a class which has different interfaces compared with the rest of classes or several classes which have different interface so they can works together. The object adapter implements the target interface by delegating to an adaptee object at run-time. The class adapter implements the target interface by inheriting from an adaptee class at compiler-time. Since multiple inheritance is not supported by many languages including Java and is associated with many problems we have not shown implementation using class adapter pattern. The Adaptor class contains the Adaptee class. Which meansAdaptee class will be used by Adaptor. There is a class which its interfaces do not match the one you need. There are several subclasses but it's unpractical to adapt their interface by subclassing every one. The code is more resuable and flexible. Clean code because the client/context doesn't use a different interface in each concrete class and can use polymorphism to swap between different adapters. As you can see the Android class has not implemented the warrior's interface. So, the class AndroidAdapter is responsible for solving this problem. In this case, the races have different interface to communicate between them. In concrete, each race has one or several methods to shared its power. For example, the humans have sharedPower and the namekians have getPower and even more complex are the saiyans which have two methods to shared its power (myPowerPart1 and myPowerPart2). The solution to do that several races works together is used the adapter pattern as you can see in the following UML's diagram. A new adapter class is used for each class, this adapter class contains the original object and the methods that implements the interface. The code for this example is quite easy. Finally, all the objects contributing energy to fight evil and achieve great power. I have created two npm scripts that run the two examples shown here after applying the Adapter pattern. The most important thing has not implement the pattern as I have shown you, but to be able to recognise the problem which this specific pattern can resolve, and when you may or may not implement said pattern. This is crucial, since implementation will vary depending on the programming language you use. Design Patterns: Elements of Reusable Object-Oriented Software by Gamma, Helm, Johnson, & Vlissides, Addison Wesley, 1995. 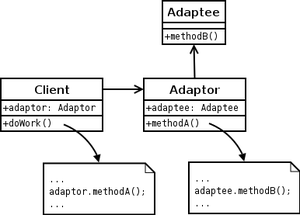 The Adapter Pattern — Wikipedia.